The first 1,000 service members or vets to stop by the USAA booth in Touchdown City will get one of the same towels used by players at the game courtesy of USAA. Sunday is Military Appreciation Day at CenturyLink! There are so many things going on and rather than repeat them, I’ll allow you to check out the links along the right side of the newsletter. The Seahawks released their list of Military Appreciation Day activities, and among the highlights are a pair of Medal of Honor recipients chosen to raise the 12th MAN flag and lead the team out of the tunnel. As you can see in the photo to the right, make sure to swing by Touchdown City and visit the USAA booth. The first 1,000 military members and veterans will get one of the same towels that players will be using on the field. Touchdown City opens at 10am this week, so be sure to get there early! If you’re looking to tailgate before the game, the official spot for Military Sea Hawkers is in the north parking lot. If you’re coming in from the north, look to the left where the RVs are parked and you’ll see the Military Sea Hawkers banner. That marks the area where military past and present can gather before the game and meet up with fellow members of the club. After the game, be sure to come by the King Street Bar and Oven for our annual Military Appreciation Day postgame party. It may take 45 minutes to an hour before everyone eventually rolls in, so don’t be too discouraged if you show up right after the game is over and nobody is there yet. You can RSVP by clicking on the postgame party link on the right or checking out the event page on Facebook. It’s a late night already and I have to get up early to hit the road to head out for the game. Apparently snow season in Montana has decided to hit the roads starting tonight. Bad news this week. Not only are the Seahawks not on AFN or DTS, the game of the week is a 49ers game. I’d say you could enjoy rooting for San Francisco to lose like most Seattle fans do just about every other week. But with the possibility of home field advantage throughout the playoffs in play, some might be tempted to root for the Saints to lose this game. Well, however you want to handle that internal conflict it’s completele up to you. The bad news is that you’ll be without Seahawks football overseas for this week as well as the team’s bye week. The good news is the next game is a Monday Night Football game, guaranteed to air overseas! In the meantime, before Fan’s Choice opens up again for games on December 8th, I’ll be on the lookout at Microsoft for someone who can come up with a program to stuff the ballot box for our team. The Seahawks played their most complete game of the season in their dominant 33-10 victory over the Atlanta Falcons. Not only that, but they did it on the road to go to 5-1 on the season away from CenturyLink. And it was a 10am PT start. The idea that Seattle isn’t a good road team can officially be put to bed if it hasn’t already. At 9-1 overall, Seattle is in a very different position than this time last year when they earned a 30-20 victory over the Vikings to go to 5-3. Now they’re in position to earn home field advantage throughout the playoffs and the Vikings are going to have to fight to not finish last in their division. Master Sgt. Traci Williams, president of the Military Sea Hawkers and board member for Operation Ward 57, is on the show this week to talk about Sunday’s Military Appreciation Day activities and the Seahawks matchup against the Vikings. 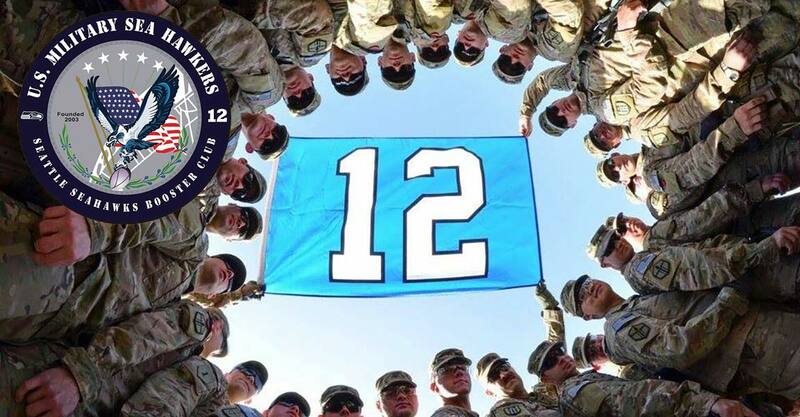 There will be a Medal of Honor recipient raising the 12th Man flag, another MOH recipient leading the team out of the tunnel and plenty of other activities to honor our men an women who are wearing and have put on a uniform in defense of our country. Adam and Brandan take a look at how Russell Wilson is comparing to other quarterbacks in their sophomore season. From the email bag they talk about why you aren’t seeing a lot of major contributions by rookies and talk about how not to be a “bandwagon” fan. This week’s candidates for the “do better” segment belong to Donald Penn, offensive tackle for the Tampa Bay Buccaneers, and Bears fan John Grant who tazed his wife after a bet on the Bears vs. Packers game. Earl Thomas gets Adsam’s nod for Better at life than Skip Bayless, and in the spirit of Veteran’s Day,Brandan picks the team of veterans at ESPN and the video montage that played during their recognition.